Exactly one week after the release of his controversial album ‘Untitled,’ Nas’ highly anticipated tour officially kicks off July 22nd in Montreal, Canada. Eight of his concerts will overlap with the Rock the Bells tour which will begin on 7/19/08 in Chicago, IL at the First Midwest Bank Amphitheatre. Nas announced Tuesday that as a treat to his MySpace fans, he plans to do a free pre-release show at the Roxy on Sunset in West Hollywood, CA on Friday 7/18/08. Along with special guest Talib Kweli, Jay Electronica, and DJ Green Lantern, the tour will make its way down the East Coast to the ATL on Thursday July 31st, 2008 at Center Stage Atlanta. Doors open at 6:30p. All ages welcome. The Jones Experience in Atlanta is brought to you by Sol Fusion, Sugar Hill, and Guerrilla Union. Stay tuned for event updates from J. Carter of Sol Fusion. For ticketing information, visit Ticket Master on-line at www.ticketmaster.com/ or by phone: 404-249-6400. 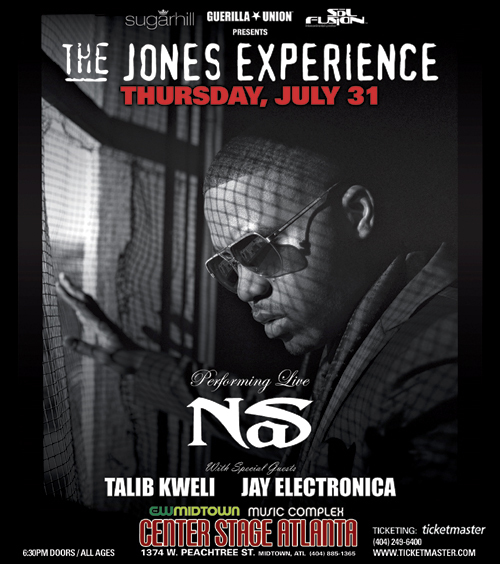 * – The Jones Experience concerts that overlap with the Rock the Bells 2008 International Festival.